MTH DCS Accessory-Interface-Unit (AIU) provides 10 each SW(itch) ports and ACC(essory) ports. You cannot reconfigure an SW port to be an ACC port or vice versa. So if you use up all 10 ACC ports and need one more, it doesn't matter that you have any spare SW ports - buy another AIU for >$100 (MSRP). Here's a way to get ACC port functionality from an SW port for about $5 out-of-pocket. Additional ACC ports after the first are less than $3. The user-interface will be arguably unconventional in that you will press the SW port "diverge" button to turn ON the accessory, and the SW port "straight" button to turn OFF the accessory. 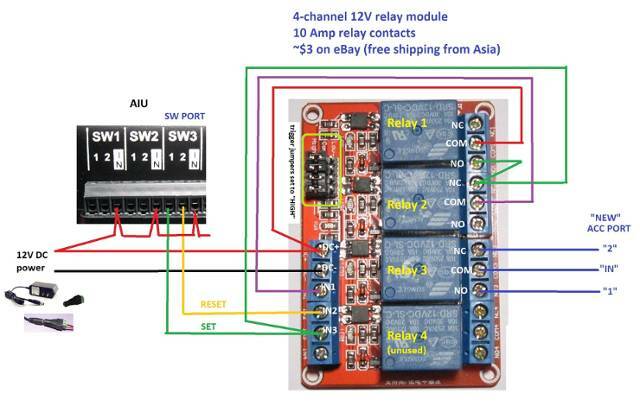 The star of the show is the 4-channel, non-latching 12V DC relay module for less than $3. Only 3 of the relays are used to make a latching relay that is "set" when the diverge button is pressed, and reset when the straight button is pressed. The wiring is somewhat tedious but it is what it is. Here it is in action. The $2 12V DC power supply can supply at least 10 modules so each additional ACC port only requires just the 4-channel relay module. Since only 3-channels are used per "new" ACC port, some wiring and space can be saved using 8-channel or 16-channel relay modules. 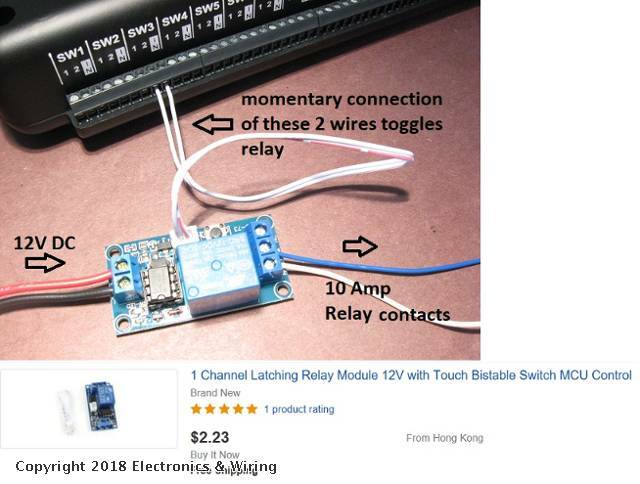 These modules have similar less than $1/relay pricing. The relays in these modules start in the OFF condition so, like an AIU, the ACC port will be OFF when you power on the TIU/AIU. The wiring of the multi-channel relay module is somewhat tedious to say the least. 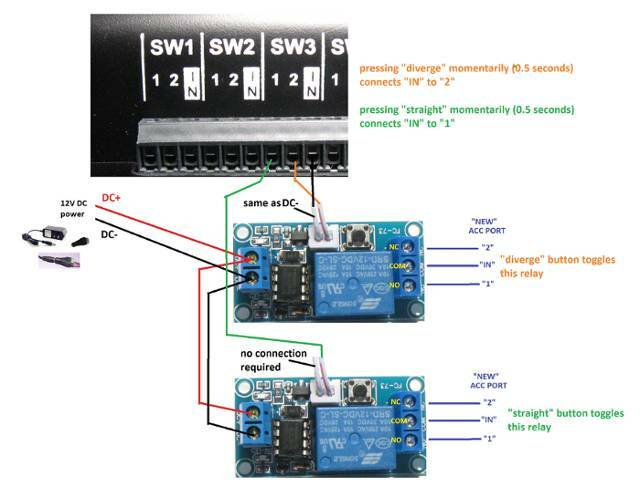 Another idea is to use a so-called bistable relay. On each trigger, a bistable relay alternates (toggles) between On and Off. So unlike the previous method which has 2 inputs (set and reset), the bistable method has a single input (toggle) which alternates between ON and OFF. So rather than pressing "diverge" to turn ON and "straight" to turn OFF, you press "diverge" to turn ON, then "diverge" again to turn OFF, then "diverge" again to turn ON, and so on. The "straight" button has no effect. And here is is in action. Perhaps obvious, but the downside of this method is you can't directly or absolutely set the Accessory to ON or OFF. You can only alternate between ON and OFF with each button press. This may be a non-issue since you might be watching the Accessory and can visually see it operating (or not). In any case, with the bistable relay, the relay itself starts in the OFF condition when you first turn on the AIU for an operating session (presumably the 12V DC relay power is turned on at the same time as the TIU/AIU). 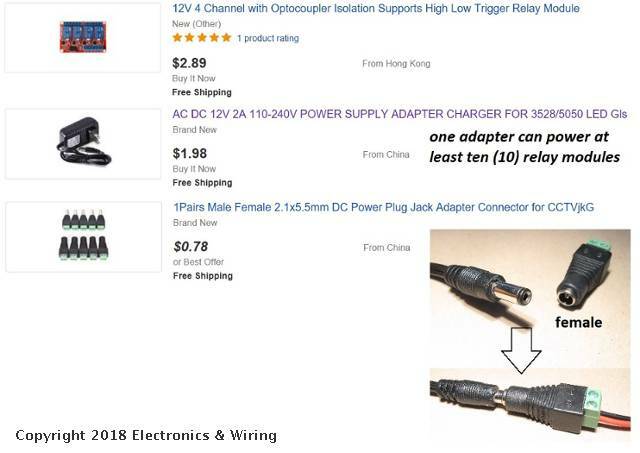 As with the latching relay method, a single 12V DC power adapter can supply 10 or more bistable relay modules so the cost for each additional ACC port is less than $3 out-of-pocket. The particular bistable relay module shown can be doubled up such that a single SW port can create 2 "new" ACC ports.